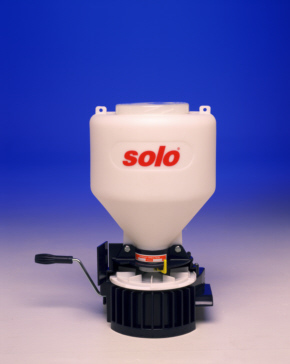 The Solo Spreader is one of the most versatile and comfortable portable granule spreaders available. It can hold far more than most and has many features and design advantages making it supreme for jobs on turf that range from 5,000 to 10,000 sq/ft. Some advantages include: 1) A holding tank which is large. This allows for less fill ups and more coverage per tank. 2) Comfortable carrying strap which goes around your neck and shoulder so your body is able to carry the extra weight easily. This makes the work and weight easier to manage. 3) Better turning mechanism which lasts longer, is easier to turn and it’s prop propels the granules more evenly and consistently. 4) It has a wider range of adjustments insuring you get the right flow. 5) It has a directional setting so you are able to control exactly what side of the unit granules come out.